This page is about the French jet fighter M.D.452 IIC. For the other version, see M.D.452 IIA. 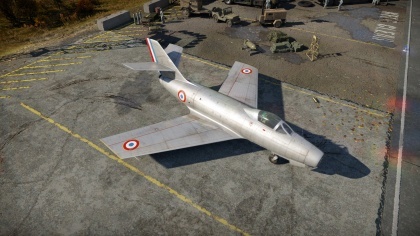 The M.D.452 Mystere IIC pre-production is a Rank V French jet fighter with a battle rating of 9.0 (AB/RB/SB). 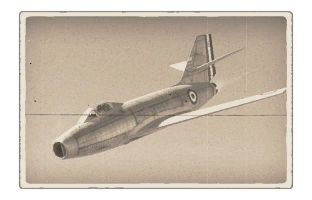 This aircraft was introduced in Update 1.77 "Advancing Storm". The two cannons are arranged in the belly portion of the fuselage exiting the aircraft just before the pilot's location. Each is armed with the same amount of ammunition, which means that both guns will fire with each other until empty. The M.D.452 IIC offers better ordinance than it's an earlier in-game variant, the IIA. This makes it more effective in Tank RB and allows use as a fighter-bomber in Air RB. It is generally more manoeuvrable than most other 9.0 aircraft it faces, the only ones you would have a tough time turning with at this BR would be any of the Sabres. Since its roll rate is comparable to the Sabre's once the "New Boosters" modification is installed, it opens up the playing field a bit more.